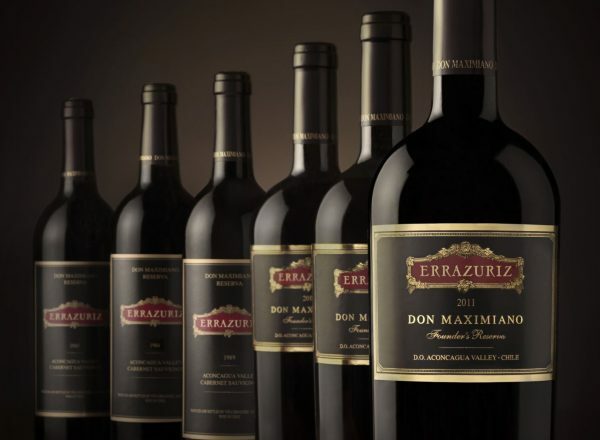 Don Maximiano Errazuriz founded Viña Errazuriz in 1870 in the Aconcagua Valley, 65 miles north of the capital, Santiago. 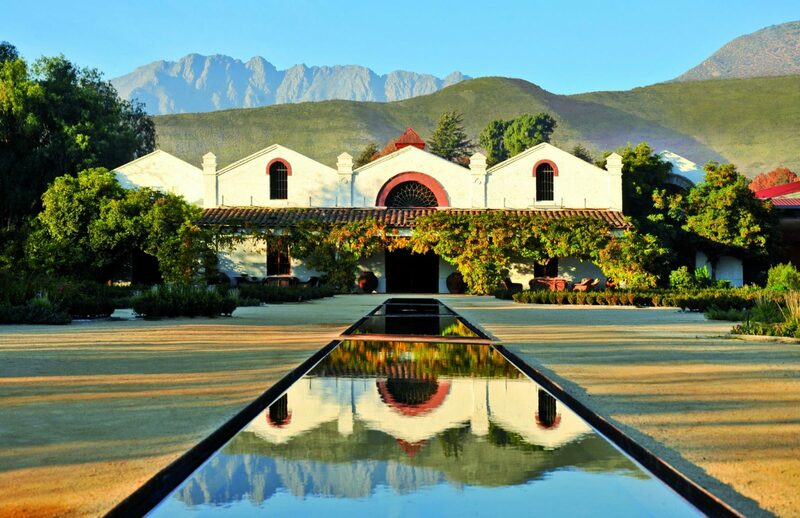 Recognizing that this valley, with its hot, dry summers and moist Pacific Ocean breezes, was ideal for growing grapes, Don Maximiano sent for the finest clones from France and with tenacity and perseverance transformed this barren land into a world-class vineyard. 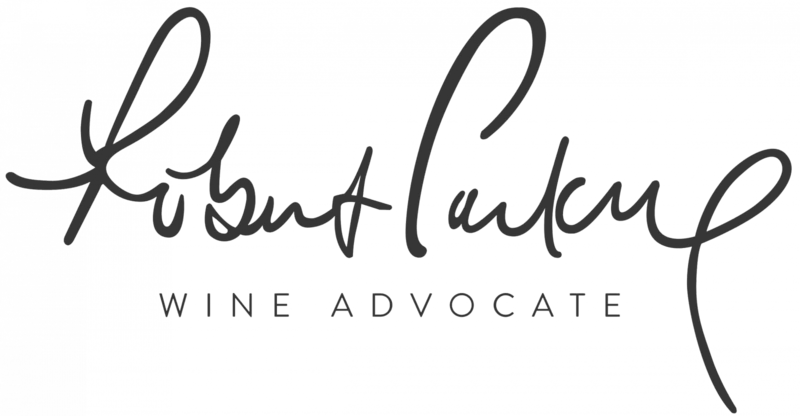 Today, the tradition of quality lives on with Don Maximiano’s descendant, Eduardo Chadwick. 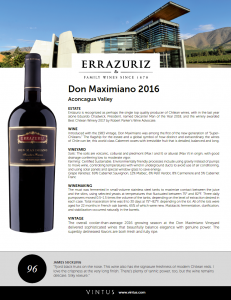 The Don Maximiano vineyard is located in the Aconcagua Valley and the oldest among them are Max I, Max II and Max V blocks. The region has a long dry season with moderately warm summer days cooled by the soft evening breezes that enter the valley from the Pacific Ocean. 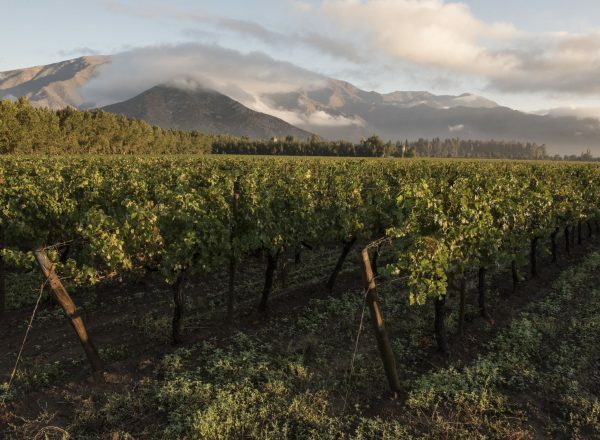 The Cabernet Sauvignon and Carmenere vines were planted in 1978 and 1993, respectively, while the Petit Verdot was planted in 1999. 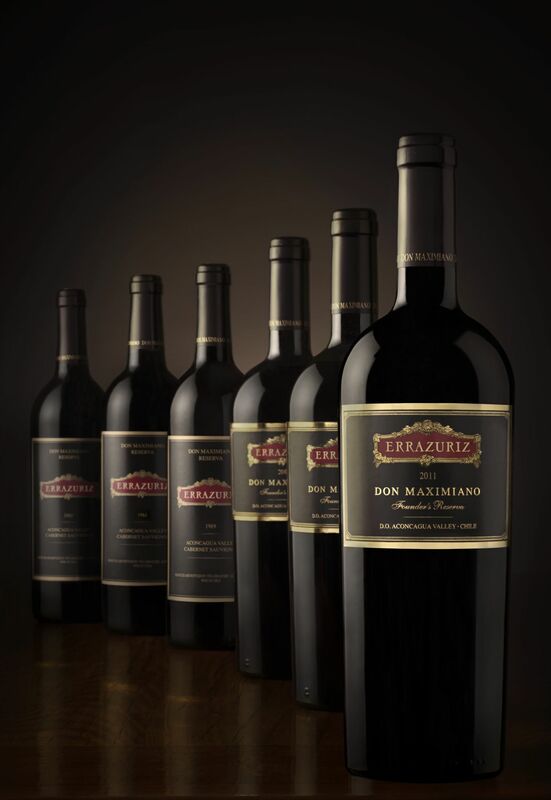 The three vineyards that contribute grapes for Don Maximiano Founder’s Reserve are planted on north or northeast facing hillsides with 5°–25° of slope. 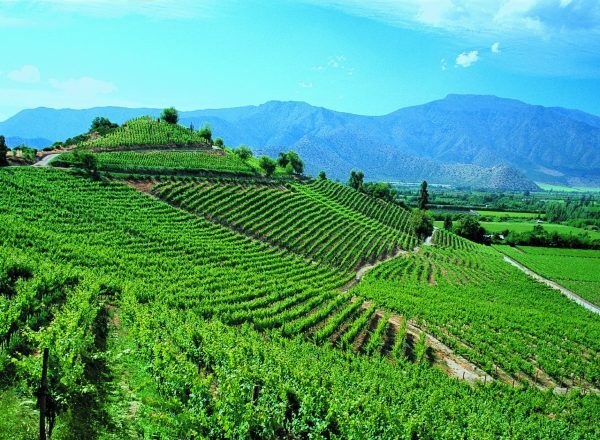 The soils are volcanic, colluvial and piedmont (Max I and II) or alluvial (Max V) in origin, with good drainage conferring low to moderate vigor. The must was fermented in small-volume stainless steel tanks to maximize contact between the juice and the skins, using selected yeasts at temperatures that fluctuated between 75° and 82°F. Three daily pumpovers moved 0.5–1.5 times the volume of the tanks, depending on the level of extraction desired in each case. Total maceration time was 8 to 30 days at 75°–82°F, depending on the lot. 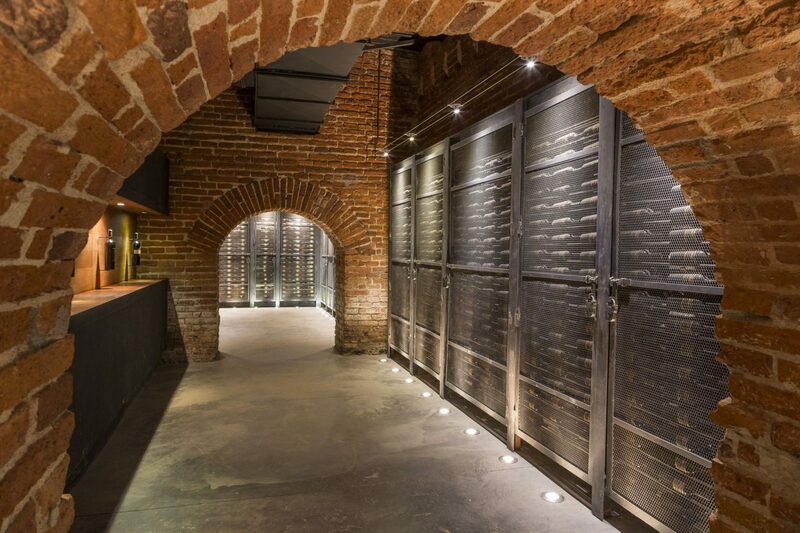 All of the lots were aged for 22 months in French oak barrels, 65% of which were new. 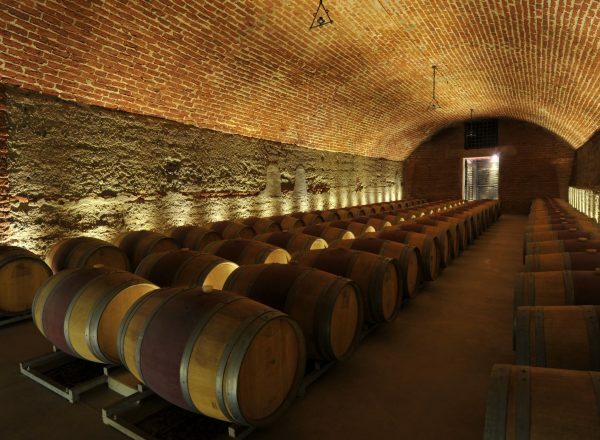 Malolactic fermentation, clarification, and stabilization occurred naturally in the barrels. Rainfall arrived well into winter having experienced a very dry beginning to the growing season. These rains extended until October alongside cool spring temperatures. This scenario delayed the usual date of bud break by 5 to 7 days and resulted in the slow growth of the canopy. Towards the end of November, temperatures shifted to warm spring days, activating the vegetative growth while ensuring a healthy flowering and fruit set. Summer began with warmer weather at the end of December, with temperatures that were close to recorded averages, and towards January it turned to slightly cooler conditions once again. Even though veraison began at a similar date to previous years, it was longer and more uneven due to the lower heat summation achieved. February arrived and provided warm summer days and a heat summation that was 6% higher than the average for this month, helping even out the heterogeneity of the crop. March was cool once again, so the grapes accumulated sugar at a gentle pace and reached phenolic maturation with a particular balance of bright acidity and mellow alcohol levels towards the end of the month and beginning of April. The total heat summation of the growing season was 7% lower than our recorded averages. 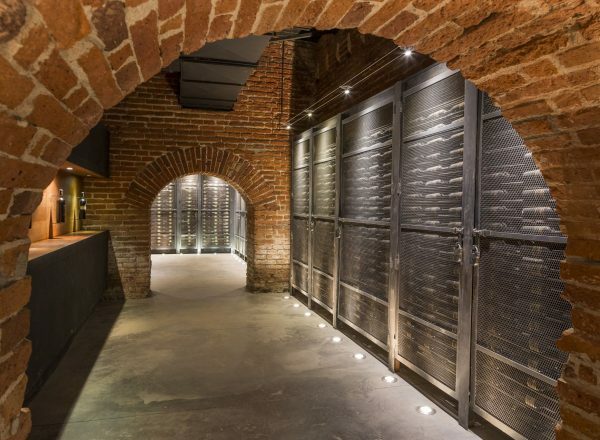 The harvest was concentrated between the end of March and the beginning of April and fortunately, the winery had most of their grapes in their cellar once the substantial rains of April arrived. Aromas of roasted coffee bean, cocoa and cassis intermingle with notes of fresh cranberry and cherry pie. On the palate, penetrating red cherry, blackberry and blueberry flavors predominate this inviting wine. There is freshness and structure along with focus and pristine delineation. Great tension and concentration, with refined tannins and an amazing balance. Certified Sustainable. 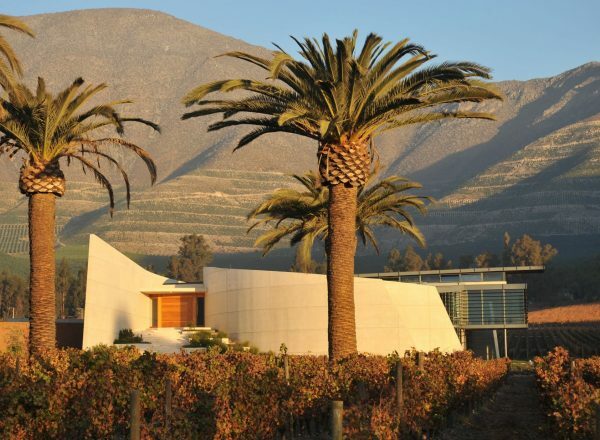 Environmentally friendly processes include using gravity instead of pumps to move wine, controlling temperatures with wind in underground ducts to avoid use of air conditioning, and using solar panels and special window glass to save energy. 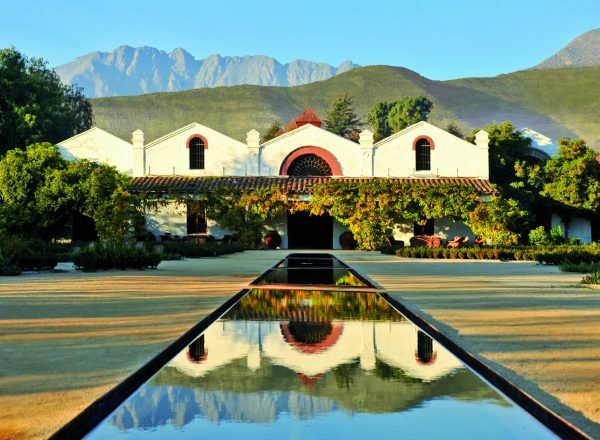 "An ultra classical Aconcagua Cabernet-based blend"
Wine Advocate - "It's an ultra classical Aconcagua Cabernet-based blend with good ripeness while keeping the freshness, and it has generous oak that does not overwhelm but makes the wine softer and spicier. It has some fine-grained, slightly dusty tannins. 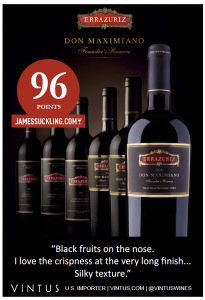 The very classical label is very coherent with an updated classical blend." We'll go out in a limb here and say that this is one of the world's great values in quality Cabernet Sauvignon and, beyond that, a Cabernet that utterly reflects where it is grown. A perfect package of fresh and savory fruits and spices within a frame of juicy and supple tannins that offer both pleasure and structure. 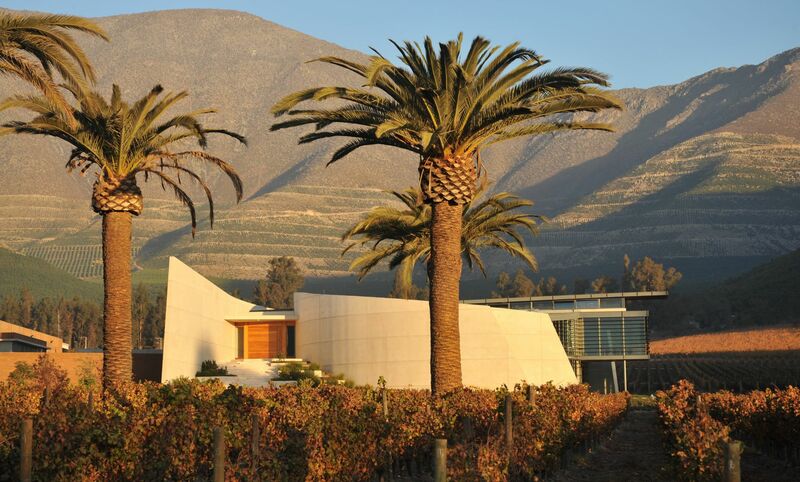 The grape long-lost in Bordeaux that has become a unique signature in Chile, MAX Carmenere is captivating with aromas of spice and black fruit on the nose, along with black pepper, toast and a long, silky palate. This voluptuous, juicy wine is generous in soft tannins, and its tremendous concentration and typicity promise excellent cellaring potential. Hailing from a daring planting nearly 15 years ago of vineyards fewer than ten miles from the Pacific Ocean, MAX Pinot Noir is a stunning expression of Pinot Noir that we believe makes it one of the highest quality, most interesting, and most original Pinot Noirs available at its price from anywhere in the world. One of Francisco Baettig’s favorite varietals to work with, year after year MAX Chardonnay is noted for its crispness and lively acidity. 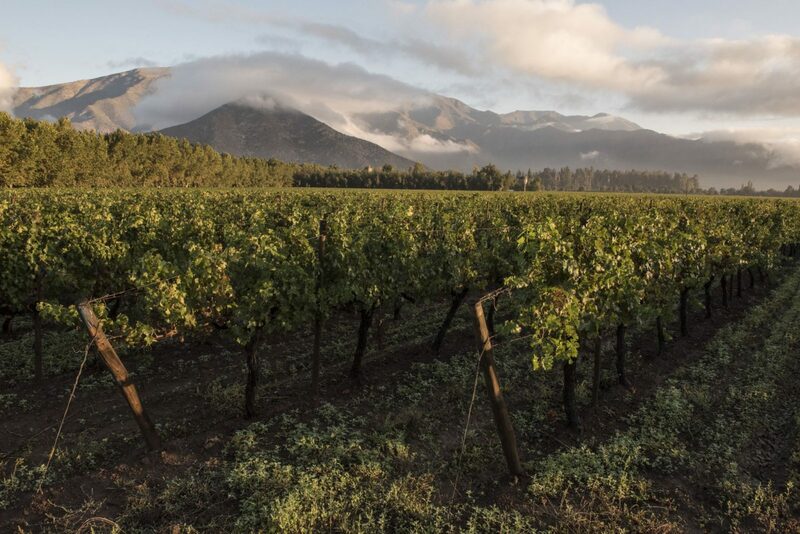 The exceptional soils and cool ocean breeze provide optimal conditions for Chardonnay in Errazuriz' coastal vineyards, located just 8 miles from the Pacific. Th­e diverse soils control plant vigor, producing fruit that is balanced yet intensely concentrated, with a beautiful fresh citrus and mineral profile. 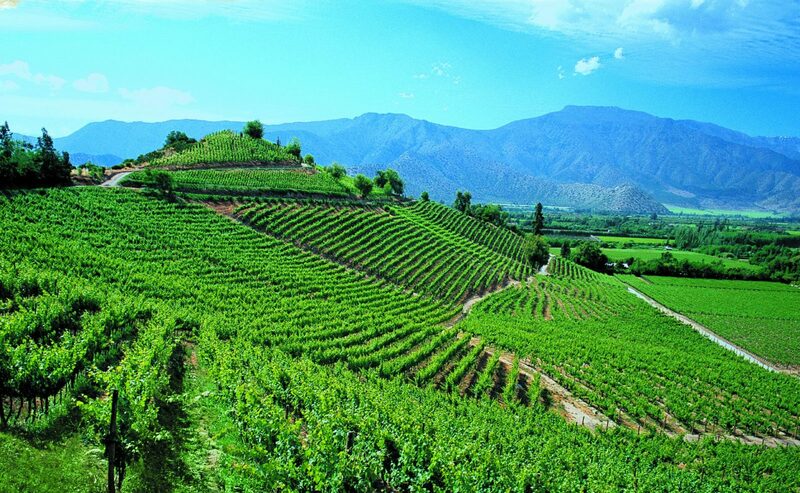 Errazuriz' Chardonnay Aconcagua Costa (formerly referred to as the Wild Ferment Chardonnay) is recognized as perhaps the top Chardonnay from South America. 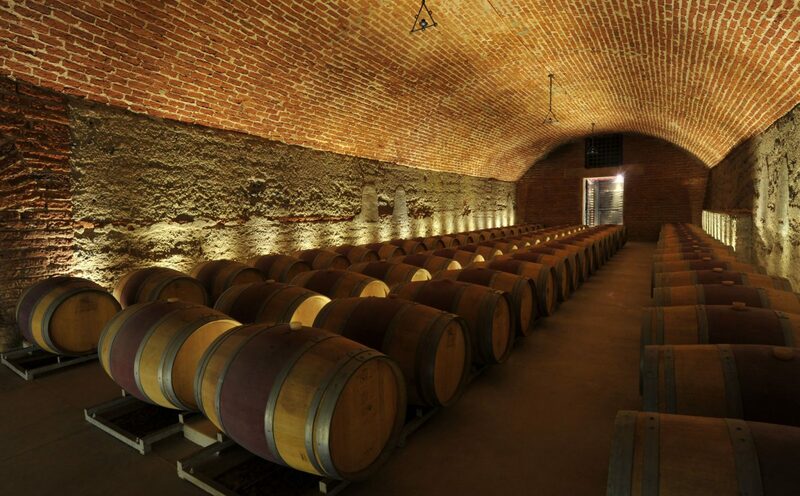 Errazuriz ferments its best lots of Chardonnay using natural yeast. 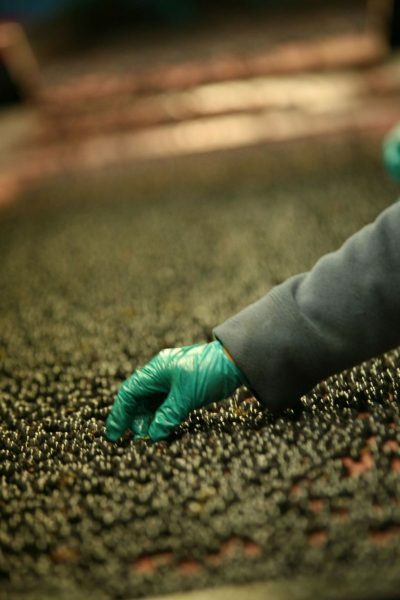 Natural fermentation starts slower than inoculated fermentation because the yeasts must grow to sufficient numbers to transform sugars into alcohol. 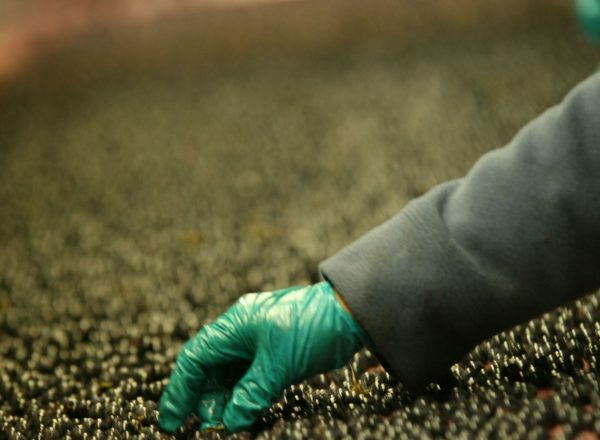 During this period the yeasts produce by-products which add distinctive flavors and complexity to the wine.